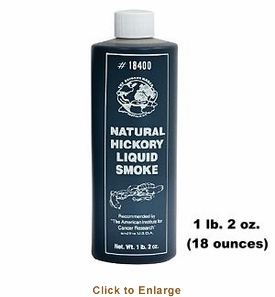 You�re viewing our Sausage Maker natural hickory liquid smoke � 18 oz. TSM's liquid smoke is a natural product with no synthetics. Made of concentrated moisture from wet hickory wood, the liquid is bottled for use. This liquid naturally flavors meats with the taste of wood smoke. Use sparingly as the liquid is very concentrated and too much gives meat a burnt taste. Add smoke flavor to turkey, beef, pork and chicken in your oven. Using TSM's liquid smoke is fast and easy, simply mix the ingredients from the kit with cold water, soak the meat and cook as you would in your oven. Recommended by the American Institute for Cancer Research. We are available to answer any questions you may have about our products. 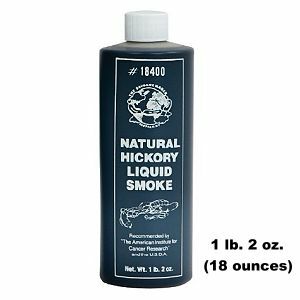 Scroll down to view our Sausage Maker natural hickory liquid smoke � 18 oz.